Simple and Affordable Valentines Day Home Decor that’ll Brighten Your Home Instantly! Need some Valentine’s Day home decor to brighten your home? As the long, chilly days of January come to an end, maybe you’d like to add some decor to your home that is more cheerful and bright. Valentine’s Day is the perfect opportunity to add bright pinks, reds, and even fuchsia colors to your home. Don’t get me wrong. I love the cozy, neutral colors of Winter decor. But adding some Valentine’s Day pops of color can go a long way during the middle of Winter! Vivid reds, pinks, and fuchsias can add that extra layer of cheerfulness to your home in preparation for the worldwide holiday of love. We all look forward to the day that so many of us express our love to family and friends on Valentine’s Day! It’s the one day we celebrate with our loved ones. And remind them how much they mean to us. 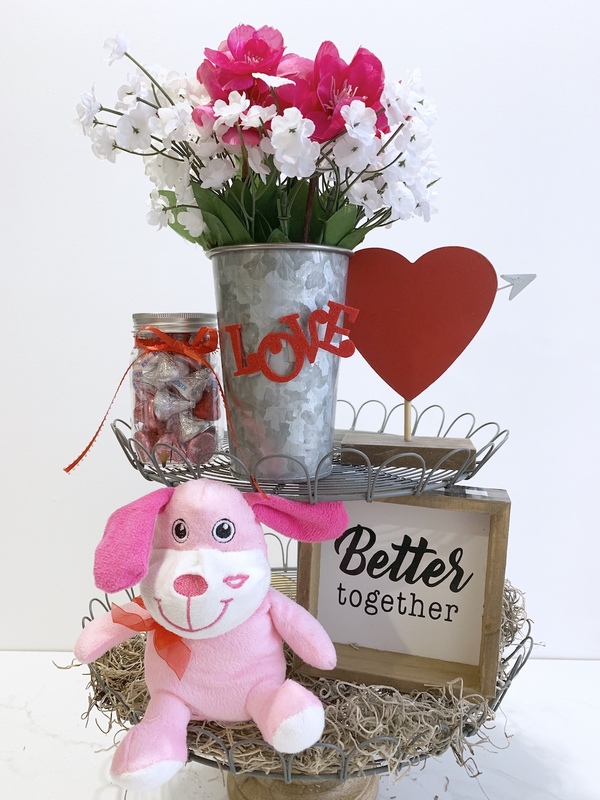 There are so many St. Valentine’s Day home decor ideas to choose from: a simple container with flowers, a pretty Valentine’s Day message display, or a gorgeous garland to hang on your mantel. Flowers of pink, red, and fuchsia are the colors for Valentine’s Day. Take a look at our ideas and let us know what you think in the comments below! The Messages of Love floral bucket required 6 items to assemble. We used flowers, galvanized floral pail, plant labels, black Sharpie marker, floral tape, and stem wire. The flowers are from another project. We cut the flowers stems so they fit in the galvanized pail. As we cut the flowers, we placed them in the galvanized floral pail. Next, we created the Messages of Love. Using the black Sharpie which is waterproof, we wrote Love-themed messages on the plastic plant labels. The plant labels are about 5 inches tall and too short for our purposes. We used stem wire to lengthen the plant labels. Wrap the plant labels to the stem wire using floral tape. If you do not have stem wire, you can substitute chop sticks or a plastic knife to lengthen the plant labels. 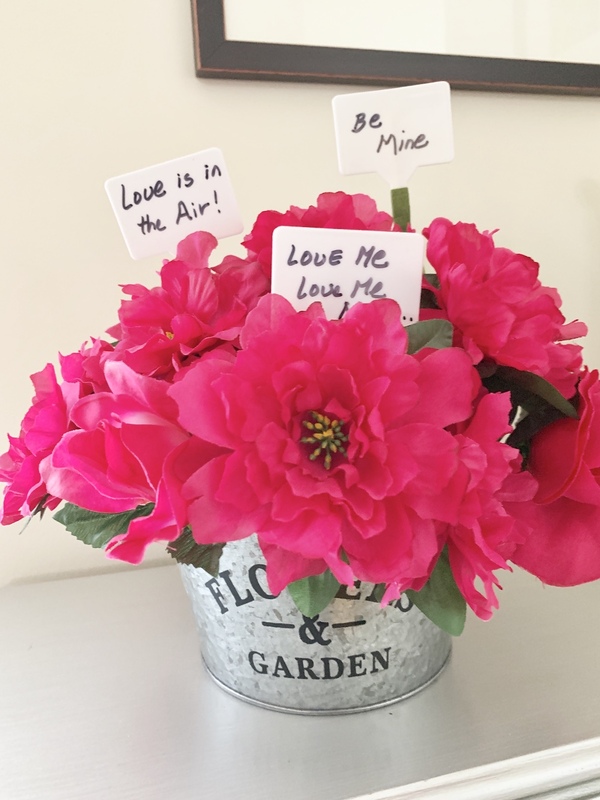 To complete the Messages of Love floral bucket, we inserted the Love messages in the floral pail. The messages rest right above the flowers. The floral pail, floral tape, and plant labels are all from the Dollar store. Ten plant labels cost just one dollar. You can write messages such as the old standard: Be Mine, Be My Valentine, Love is in the Air, Love you to the Moon and Back, Love Me – Love Me Not, All You Need is Love, etc. You could also simply write XOXO for hugs and kisses. Any of these messages will look great. Add as many messages as you like. Personalized the messages with meaningful notes to your spouse, and family. These are your own Valentine worthy love messages. This project is so simple, so quick and so easy. Not to mention, without a doubt it is definitely cheap! Even the kids can help write the love messages on the plant labels. Use pale pink flowers for subtle color or bold fuchsia for a big impact. This bundle of Valentine Day flowers with special messages of love will look gorgeous in any room. It is very affordable to make yourself. You can also make several as gifts for teachers, grandparents, extended family, or friends. Using my trusty farmhouse two tiered stand, I created a Valentine’s Day styled farmhouse stand. The first thing I added to the stand was a plastic craft bottle full of Hershey’s Valentine kisses. Since chocolates are a big part of Valentine’s Day, I included the conveniently named Hershey’s kisses! I wrapped some pink flowers with Baby’s Breath using green floral tape. Then I added the Baby’s Breath and pink flower bundle to a small galvanized French flower bucket. To finish off the French flower bucket, I added a bright red “Love” felt word. Next, I included Cupid’s galvanized arrow through the red heart as symbolic for everlasting Love. On the lower tier of the farmhouse stand, I added a lovable and kissed pink pup. The always smiling pup with red bow sits on a soft bed of Spanish Moss. A buffalo plaid wrapped “Better Together” farmhouse print is next to the smiling pup. Simple, quick and easy decor. It’s something even the kids will enjoy putting together! The puppy, craft bottle, flowers, and Love felt word are from the Dollar Store. 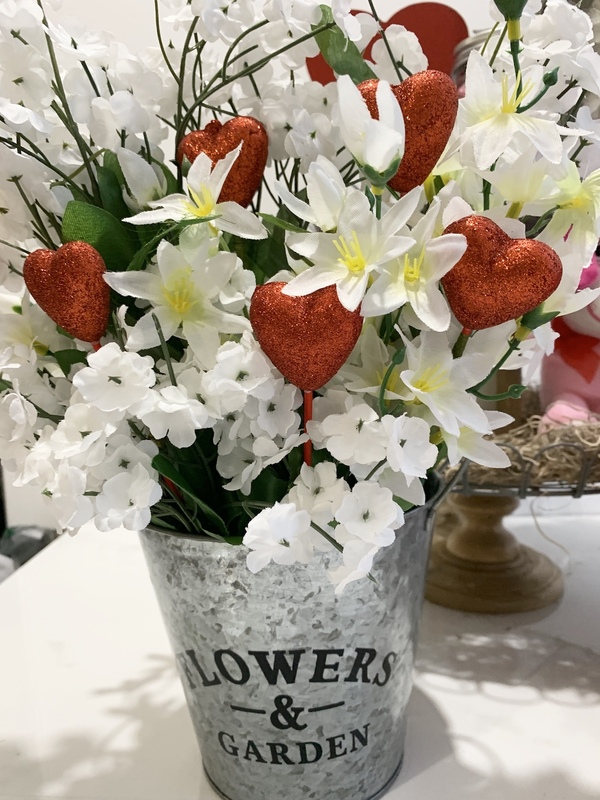 To create this Heart Floral Bucket, we added white floral bouquets to the galvanized floral bucket. I then added a few bright red hearts for a little Valentine’s Day color. The fourth idea is an adorable Be Mine Kitty Crate. The crate is a Darling Clementines crate. 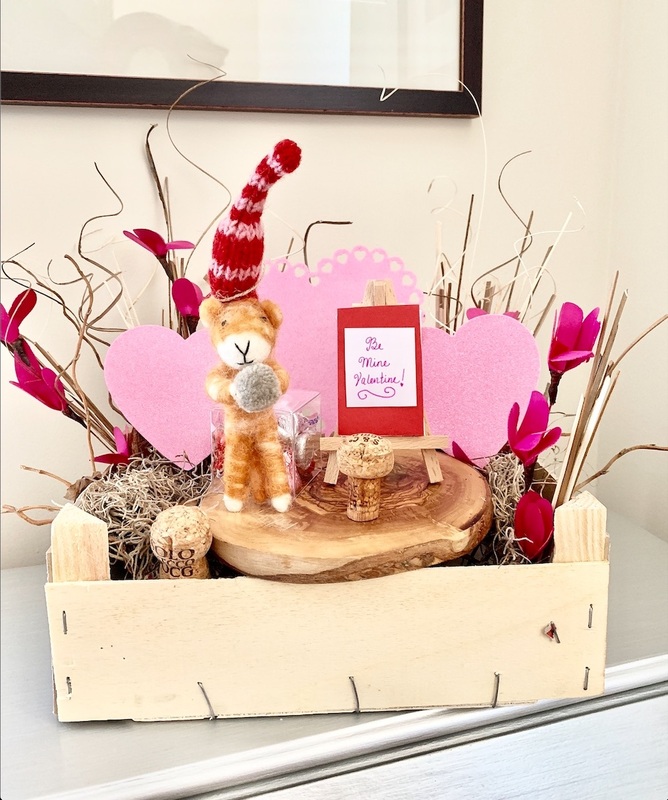 The crate is small and perfect as a base for this Valentine decor. First, I lined bottom with paper board to cover the holes in the bottom of the clementine crate. Then, we added a few curly reeds to the bottom of the crate. Using floral tape, I wrapped one pink flower with brown and natural colored reeds into a small bundle. I created about 4 pink floral bundles and 4 additional bundles of only brown and natural reeds. Next, we added the olive wood tray across the crate. Spanish moss was dropped into the crate on each side of the olive wood tray. The floral and reed bundles were added to the crate corners. The hearts were added in the background in front of the floral bundles. A Valentine message of ‘Be Mine Valentine’ was placed on the easel. The wine cork in front of the easel acts as a work stool! Additional finishing touches include the kitty and chocolate kisses. Hershey’s kisses in a clear cube and a Kitty complete the Valentine look. Some walk a line and others perform a balancing act for their love ones. 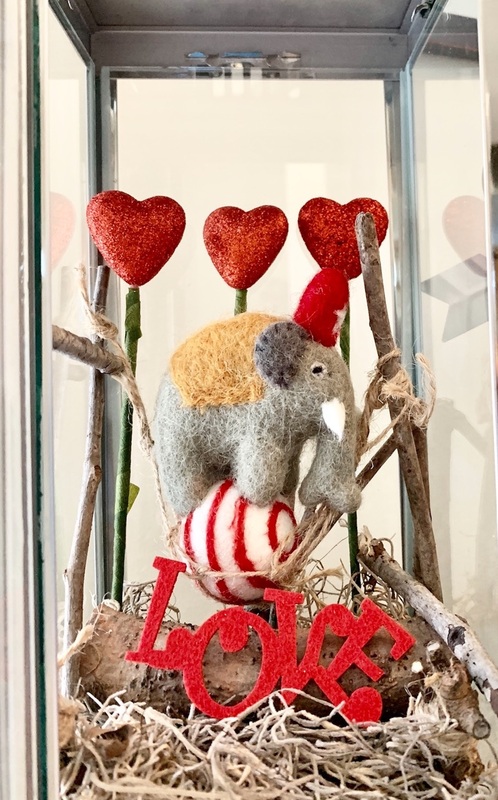 This lovable elephant performs a balancing act on a striped red and white felt ball. He’ll do whatever it takes to make you smile! This is another quick and easy Valentine’s Day look. To make this Valentine’s Day balancing act is simple. I had all the craft supplies on hand with the exception of the “Love” felt word. The felt word came from the Dollar Store. An affordable 12 Valentine felt words for $1. Using a lantern, we lined the bottom with Spanish moss. We used twigs and smaller tree branches to create a tightrope structure. We attached the twigs and branches using everyday brown twine. The tightrope was set up in the lantern. Three bright red hearts were added as a background. The elephant is suspended on the tightrope. The“Love” finishes off this Valentine look! These are some ways we use Valentine home decorations to brighten our home. 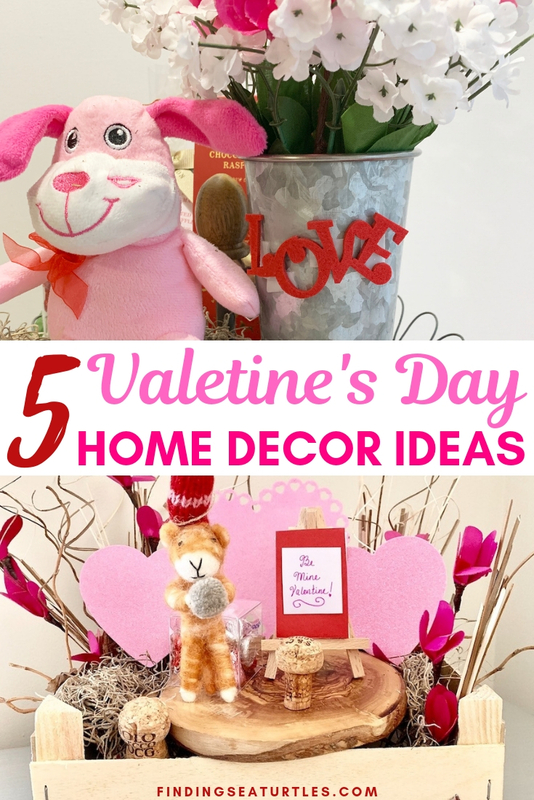 We hope that these five examples can help you with your Valentines Day decorations. If you try any of these Valentines Day home decorations, let us know how you make out! And thank you so much for visiting.